With Billy Doherty of the mighty Undertones. Recorded many songs (demos, radio sessions, including two Dave Fanning sessions by 1988, TV, etc) and did many showcase gigs but only released one single. Carling/Hot Press Band of the Year in 1990 (some would say the Kiss of Death for many a band). Lead singer Paul McLoone took Feargal Sharkey's place in the reformed Undertones. 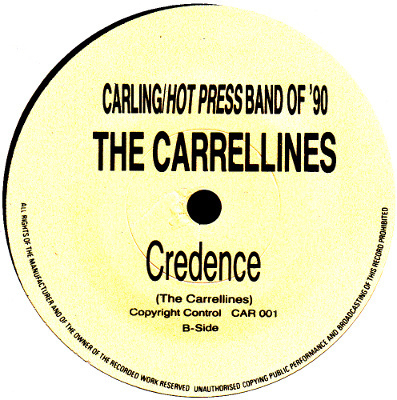 Derry band The Carrellines were formed in 1986. Their longevity has come from a unity of purpose among the four members and the conviction that their music is different and important enough to merit serious attention. Theirs is a sound that is hard to pin down to any one category but one that is unmistakably The Carrellines - unashamedly epic in its feel and yet remarkable in its diversity. 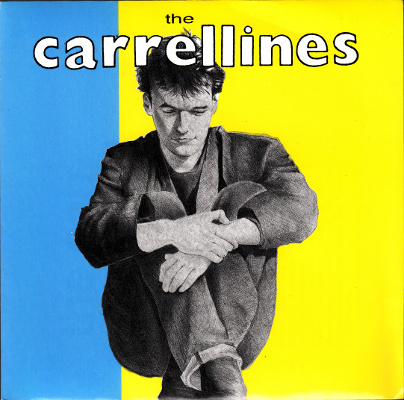 Since their first performance in June 1987 The Carrellines have steadily developed in terms of style and stage-craft. In November 1987 the band were invited to play the "Irish Rock Week" at London's Mean Fiddler, where they caused something of a stir, causing even the jaded ears of the Fiddler bar staff to prick up in approving curiosity - "the surprise package of the week", as one onlooker commented. Playing regularly at numerous venues in the North, The Carrellines drew the attention of R.T.E. radio's Dave Fanning, who invited the band to record a session for his program. Already experienced in studio work via recent demos, the band recorded an unprecedented five songs for the session, which was repeated within a few weeks. Now making increasing in roads into the National music scene, The Carreliones played the 'Cork Rock' weekend to huge acclaim which consequently resulted in an appearance on R.T.E. T.V. 's "Check It Out", in which the band were featured prominently. A new eight song demo recorded at Matrix Studios, Belfast came next, picking up airplay on both R.T.E. and B.B.C. radio. Frequent gigs at Belfast's The Limelight were rewarded by The Carrellines appearance at The Belfast Arts Festival in Nov '88. Their performance was broadcast live on B.B.C. radio. Having played extensive showcase gigs in London in January 1989, the band returned to the Big Smoke to record a three track demo at Beethoven St. Studios with Kevin Armstrong (of Iggy Pop, David Bowie and Prefab Sprout fame) and Andrew Paresi (Morrissey). Back at home, the band were invited to appear on R.T.E. T.V. 's "Jo Maxi" where they performed what is now the debut single, 'Bridesmaids Never Brides'. 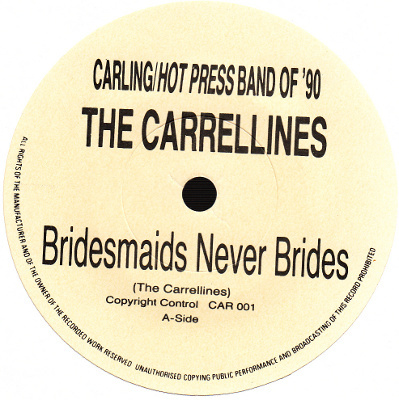 This year has seen The Carrellines come closest to achieving their goal by winning the "Carling/Hot Press Band of '90" competition. Their on-stage performance and originality swing the panel of judges and earned them excellent reviews in 'Hot Press'. 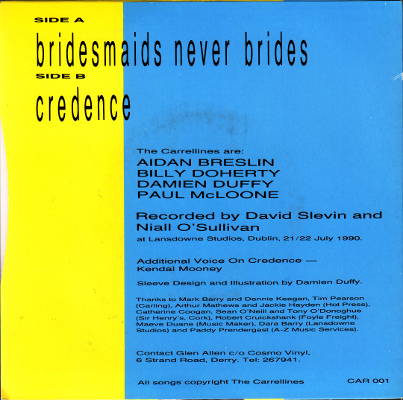 The most important follow-on from the competition is, of course, the release of the debut single 'Bridesmaids Never Brides' / 'Credence', recorded at Lansdowne Studios, Dublin. Notes: Recorded by David Slevin and Niall O'Sullivan at Lansdowne Studios, Dublin on 21-22 July 1990. Additional voice on "Credence" by Kendal Mooney. Sleeve design and illustration by Damien Duffy.